Data science is becoming more and more important in different domains such as e-commerce, healthcare, smart energy, business, social media, insurance, and research & development, to name a few. Data science projects require multiple competences such as programming, statistical and analytical skills as well as high quality communication and visualization. 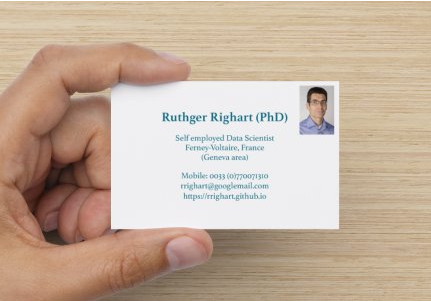 As a self-employed data scientist, I offer profound expertise with different data projects. Please visit the e-commerce case analyses for a concrete example. Clear data communication and visualization during the whole data science process. This is just a short list, of course there are many excellent tools available. Immatriculation au Registre du Commerce et des Sociétés: 833 982 358 R.C.S. Bourg-en-Bresse. Greffe du Tribunal de Commerce, 32 Av Alsace Lorraine, 01011 Bourg-en-Bresse Cedex.